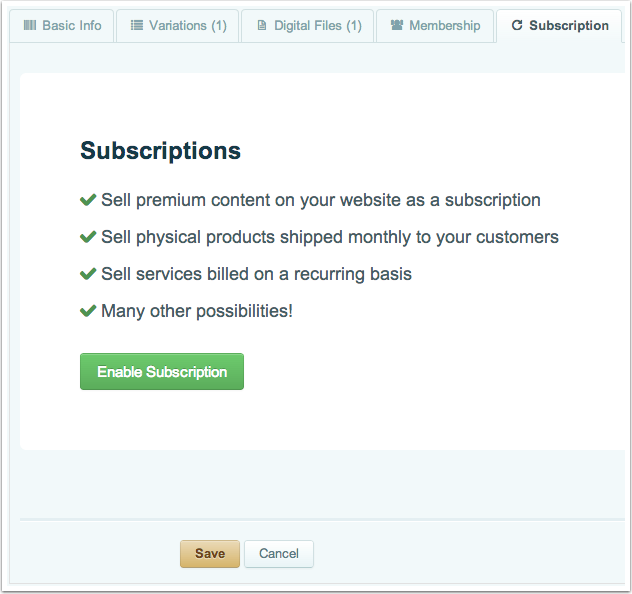 Cart66 comes with its own built-in recurring billing engine for selling subscriptions on your website. Subscriptions and recurring billing work with all of the on-site payment gateways supported by Cart66. A subscription is the same thing as a membership product except that a membership product does not involve recurring billing. Both a membership product and a subscription product enable you to sell membership access to content on your WordPress site. Create a subscription if you want your customers to be automatically billed on a recurring basis, such as once per month. To create a subscription product you must first enable the subscription option for your product. RECURRING PRICE: This amount is charged at checkout (unless you offer a trial period) and at every billing cycle. INITIAL PAYMENT: This amount is ALWAYS charged at checkout even if you offer a free trial period. This could be used for setup fees, or other one-time payments. It's a good idea to explain any initial charges to your customer, especially if you are offering a trial period for your subscription. BILLING INTERVAL: Specify how often you would like to charge your customer. For example, you could charge them once per month. BILLING CYCLES: Specify how many ADDITIONAL times you want to charge your customer NOT INCLUDING what they are charged at checkout. For example, if you want to charge the customer 4 times and you are NOT offering a free trial period, the first payment would be at checkout and you'd want to have 3 more Billing Cycles. Therefore, you would set Billing Cycles to 3 (not 4). This would collect 4 total payments. 1 at checkout plus 3 more billing cycles. TRIAL PERIOD: A trial period pushes the collection of the first Recurring Price payment out a specified amount of time. If you set an Initial Payment, that amount will still be collected at checkout. PRICE DESCRIPTION: This is the description of the price for your customers. You can customize this description. If you would like to remove the subscription for your product, click the red 'Disable Subscription' button. You want to collect $400 in 4 payments of $100 per month. The first payment happens at checkout. Scenario: $100 per month subscription with $5 trial period of 7 days. You want to have a subscription for $100 per month but you give your customers the first week for only $5. In this scenario, you will collect $5 at checkout (from the initial payment). 7 days later the first billing cycle will collect $100. Every month thereafter you will collect another $100 payment until the customer cancels the subscription. If the customer cancels during the trial period (the first 7 days) you will only collect a total of $5 because the subscription was canceled before the first billing cycle.